Getting men and women on the same page in the workplace. Former Gannett chief content officer and editor-in-chief of USA Today Joanne Lipman exhaustively researched the factors holding women back in the workplace and concluded that a lot of it has to do with “cluelessness” on the part of men. 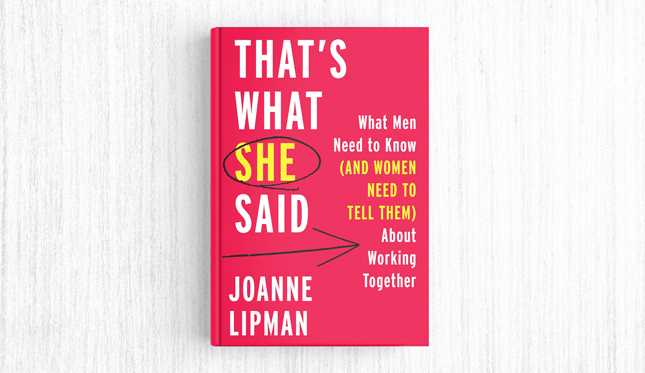 In her latest book, That’s What She Said, on sale today, Lipman looks at the research and interviews major executives with the goal of helping men be more understanding and identifying what really works to close the gender gap. Q: You obviously began this project before #MeToo took off, so I’m curious about why you decided to write this book? A: There has been this explosion in recent years of books, conference, events for women and about women. And women talk to each other all the time about these things, but they don’t talk to me. Two things that happen are that we sometimes unnecessarily demonize men, and the other is that men can sometimes be a little clueless. Let’s bring men into the conversation and figure out how to demystify the issues that women face every day. Following revelations about Harvey Weinstein and a host of other major media and entertainment figures, issues of sexual harassment and assault in the workplace are front and center, but you’re focused on a lot more than just that. The sexual harassment and particularly the sexual assault that we’re seeing now is really the extreme. But the reason we’re seeing it as such in the zeitgeist is every single woman knows what it’s like to be overlooked, interrupted, not heard, and then see a man take credit for it. We’re already starting to see some pushback, from the right, but also from traditionally liberal authors, such as Masha Gessen at the New Yorker, against the sudden explosion of accusations. What happens next? The first thing we have to understand is there is a continuum. Right now in the first flush, everyone seems to be getting painted with the same brush. There is a difference between someone who is actually sexually assaulting someone and someone who is making boneheaded comments. Clearly there is going to be some backlash. So what should be done to solve this problem? We really need to change the culture, starting from childhood. It’s about how we treat women. And it’s about awareness. It’s not about telling your sons, “Don’t be a sexual predator.” There’s not a lot out there, thankfully. But it’s about when you’re at work, do the men talk more than the women? There’s research showing female supreme court justices get interrupted three times as much as male supreme court justices. Mothers routinely overestimate how quickly their sons crawl and underestimate how quickly their daughters crawl. Everybody has unconscious biases, and one of those unconscious biases, among women as well as men, is against working women. You’re talking about changing culture from birth. That’s a tall order. How do you propose to do that? I talked to male executives who were actually trying to close the gender gap, and they gave me a number of strategies that they did. Glen Mazzara, the former show runner of The Walking Dead, started a rule in his writers’ room, which is usually very male dominated, when he noticed that the women’s ideas were never getting through, and it was because they were getting interrupted. So he instituted a rule that nobody—men or women—could be interrupted when they were presenting. That’s What She Said — What Men Need to Know (And Women Need to Tell Them) About Working Together, William Morrow, $29, 320 pages.